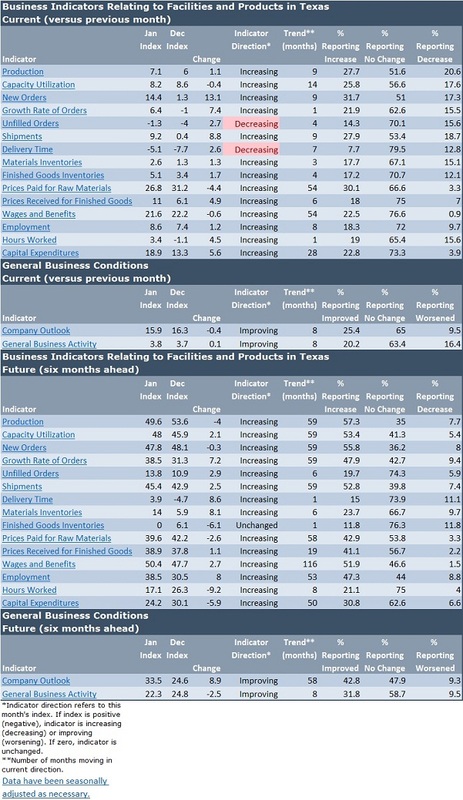 In addition to the nationwide Purchasing Manager’s Index survey on manufacturing business conditions produced by the Institute for Supply Management each month, several Federal Reserve branches also survey businesses on regional manufacturing conditions. The Federal Reserve Bank of Dallas released data on Monday showing nearly across-the-board improvements in Texan manufacturing activity. The survey reports month-over-month change and the outlook for six months ahead for 17 indicators according to responses from businesses. In the latest release 15 indicators are increasing or improving versus last month (see table below), and all 17 are positive looking ahead six months. Get more detailed data or read more on the methodology for the Texas Manufacturing Outlook Survey from the Federal Reserve Bank of Dallas. ‹ Great trip to Portland to talk Manufacturing!